Today’s post is a reprint of my story originally appearing on Sue K’s outstanding recipe blog, Savory-bits.blogspot.com. I recently met Sue K. at a writers conference in Boston and since then she has gently and persistently encouraged me to begin a blog of my own, citing accountability, deadlines, and exposure as the chief benefits. I encourage you, journeymen and foodies alike, to click over to Sue K’s recipe blog where the stories will entertain and the recipes will inspire your next meal! In my 20 year tenure as keeper of my parents’ machine, I have never used it, though I always intended to. It holds ice cream making memories of earlier times. There were yellow and white lawn chairs, seersucker pants, madras shirts and the smell of limes. I vaguely recall wielding a top-heavy hammer to chip blocks of ice in a dishtowel against the cement sidewalk, and unheeded warnings to not taste the rock salt. Over the years, my parents spoke of the legendary peach ice cream as the pinnacle of their summer party success, and the blueberry debacle, laughed off as a patent disaster – the berries frozen into tooth-zinging bullets. Making ice cream was just one of my dad’s talents. He also enjoyed the festive and splashy projects others declared too time-consuming or tricky to make such as mountains of hand cut pasta draped over white sheets to dry in the kitchen, eggplant parmigiana, spritz cookies, apple butter, and pies. Lots and lots of pies. As kids, our birthdays were marked with cakes, and our Names Days (the Feast Day of the saint after whom we were named) were celebrated with pies. There were strawberry rhubarb pies, cherry pies, pineapple cream pies, apple pies, and peach pies (always made with one interloping nectarine.) Honestly, I recall my brother with a mid-December Feast Day netting more pies than I ever did. I suspect there was a practical reason for not wanting to make a pie for my Saint Susannah’s Day in the heat of mid-August. The venerable Coldspot lingered on the kitchen chair for days like a visitor who doesn’t know when to leave. The impression of ice cream making as time-consuming, expensive, and a full-on, cranking production kept me from diving in. Then friends invited us to dinner. As one never goes to dinner empty-handed, this was the impetus I needed to bring the Coldspot experience into a New Age. A fully-formed vision of apple pie à la mode danced before my eyes. I said, “I’ll bring the dessert,” and sealed my fate. On the morning of the dinner party, before I could start the dessert from the ground up, I ventured down to my local general store to purchase some last minute items, rock salt (50 lbs. bag, “Sorry, that’s our smallest size,”) and ice. At the last minute, I bought a box of the proprietress’ outstanding, home-made lemon bars for personal consumption as I knew the apple pie would be for company. In retrospect, I should have bought a pint of the locally produced, all organic, vanilla ice cream but my giddy confidence in the ice cream department was running high. Back home, in my camp kitchen, I nervously reviewed the ice cream directions and noticed, despite having bought a huge bag of ice, that it was only half as much as was needed. There was no way I was driving back down my steep, oil pan eating “driveway” to buy more, so I filled all available shallow containers with water and hoped they would freeze in time. To begin the apple pie, I referred to my dad’s pie crust recipe still taped to the inside of my kitchen cupboard door. And as I measured and cut in the fat, I recalled pie making with my dad, a source of much light hearted competition. We had guidelines, and I kept to them in making this pie. Fruit: Apples were purchased, preferably, from the sale rack at the grocery store or from the “drops” bin at the orchard. This way, a pie celebrated thrift as well as the skill and satisfaction of making something glorious from nearly nothing. 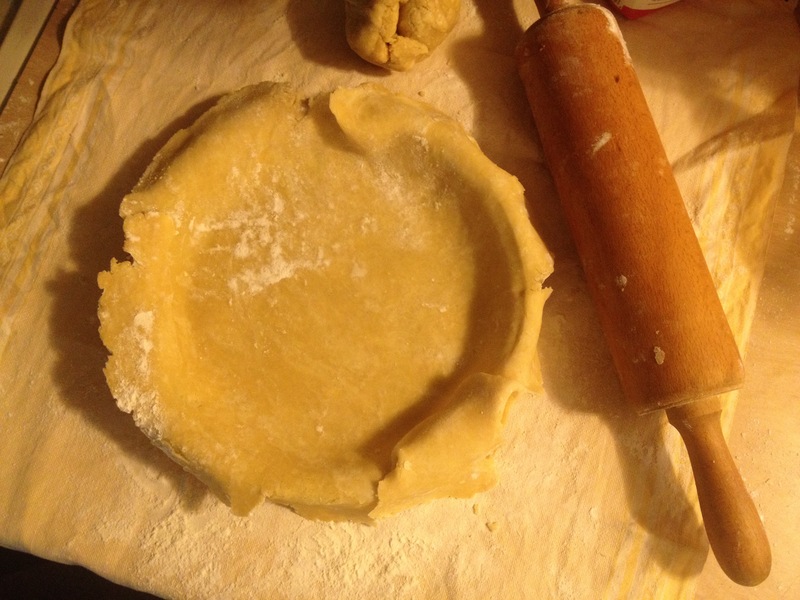 Pie Crust: Always made from scratch. Lard made superior crusts. In sealing the pie, we used the 3-finger pinch that makes the classic, undulating lip around the edge. We agreed that it had to be neat, but not too neat, with an off-hand look that said it came easily but still had imperfections for juices to bubble up here and there. Recipe: Not devoted to measuring spoons, there was never just one way to make a pie. We worked from a standard pool of ingredients and how you sprinkled and dashed and dotted was entirely up to you. 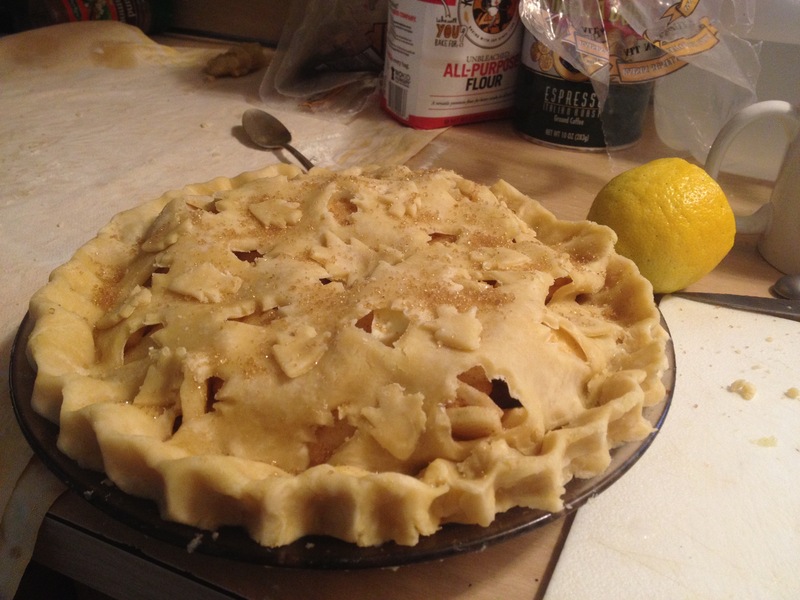 Years ago, I branched out and made a rosewater apple pie from an old Shaker cookbook. Dad, a cinnamon and nutmeg devotee, found it too cloying and tut-tutted. I maintained that the rosewater alternative was delightful. Venting: Dad preferred the traditional 5-slashes-in-a-circle, mimicking the inner lay of the apple’s seeds to vent the pie. I dabbled in the craftier cookie cutouts in the shape of an apple, a pilgrim couple in profile, a horse or a star. I have a nifty pine tree cut-out tool that will do the whole crust in one go, but Dad thought it was too finicky. Lately, I’m sure he would approve, I’ve returned to the 5-slash motif adding a dusting of sparkling sugar – a nod towards strudel. Neither of us embraced the “blackbird in a pie” ceramic vent as it could not be relied on to fully let off steam which is the most important factor in a successful pie. Serving: The first slice is always a mess. We both had the bake-in pie server that is set in the pie plate before you lay in the bottom crust. But the urge to make a pie really does seize hold with little warning – and I always forget to dig the gadget out of the drawer where utensils go to die. In all candor, using the “perfect slice” pie server is almost cheating. Pies aren’t perfect. They shouldn’t be. Love is never perfect. With the pie in the oven, the time arrived, no small moment, to reprise the 1969 French Vanilla III, double batch. To begin, the basic ice cream mixture is made from egg yolks, sugar, and milk which required a double boiler to get it to the “coat the spoon” stage. In my modest cabin, I do not have a double boiler and so fashioned one from a large pot and a slightly smaller Pyrex bowl. This worked well, but had to be managed carefully lest the simmering water leap up around the sides, à la Vesuvius, and slop into the mix. It took a witheringly long time to achieve the spoon-coating stage. I will confess, I only approximated that consistency before removing it from the heat. Then the mix had to cool before adding the heavy cream and vanilla. Even with all window fans going full blast, I doubted anything could cool in the oven-like conditions. But the cooler the mix, the faster the finished product, so, still steaming, it went into the refrigerator. Mercifully, the apple pie was done and I could finally extinguish my stout, uninsulated gas oven. I set the pie to rest on the screen porch. One glance at my two Labrador Retrievers prompted me to build a protective guardrail around the pie. That accomplished, there are two (possibly more) times when one should always take a nap and they are: a) Nap while the baby is napping. b) Nap while the mix is cooling. Following my restorative nap and a few delicious lemon bars, it was time for the rubber to hit the road. Operation Coldspot resumed outside under the maple trees. I lugged the rock salt from the car and smashed the ice, reducing my scant 50% supply to a worrying bag of shards. “Prepare your bucket.” This is your basic lasagne technique started with 3 inches of crushed ice followed by a layer of “some” salt, and so on. A closer reading of the Coldspot’s directive warned – in italics – that too much salt would produce a “grainy” ice cream and result in just the perimeter of the can freezing. Like so many legendary secret recipes, there was no indication as to how much “some” is. As I layered salt and ice around the chilled, silver canister of mix, I understood why ice cream making did not persist into my adolescent and teenaged years. I was certain I was not going to be making ice cream with this family heirloom ever again. Doomed from the start, I had not budgeted enough time or ice; I was slaving away, solo, without the benefit of a gin and tonic or camaraderie. With the dinner party hour fast approaching, I began to crank. The gears balked. I gave up on my comfy lawn chair and leaned into it. The spinning motion ground the ice and salt to way below the prescribed “top of the canister.” I had no patience to smash up the last of my half-frozen ice cubes, so I tossed them into the bucket, whole, along with “some” rock salt. I was out of ice and patience, but managed to get a limping, gritty rhythm going that I truly hoped would be the right one to make ice cream. It was alchemy as far as I was concerned. And I was no alchemist.